Food For Thought: Meat-Based Diet Made Us Smarter Our earliest ancestors ate a diet of raw food that required immense energy to digest. But once we started eating nutrient-rich meat, our energy-hungry brains began growing and our guts began to shrink. Cooking that food not only made it safer, but also easier to digest. That period is when cut marks on animal bones appeared — not a predator's tooth marks, but incisions that could have been made only by a sharp tool. That's one sign of our carnivorous conversion. But Aiello's favorite clue is somewhat ickier — it's a tapeworm. "The closest relative of human tapeworms are tapeworms that affect African hyenas and wild dogs," she says. So sometime in our evolutionary history, she explains, "we actually shared saliva with wild dogs and hyenas." That would have happened if, say, we were scavenging on the same carcass that hyenas were. But dining with dogs was worth it. Meat is packed with lots of calories and fat. Our brain — which uses about 20 times as much energy as the equivalent amount of muscle — piped up and said, "Please, sir, I want some more." "If you look in your dog's mouth and cat's mouth, and open up your own mouth, our teeth are quite different," she says. "What allows us to do what a cat or dog can do are tools." Tools meant we didn't need big sharp teeth like other predators. Tools even made vegetable matter easier to deal with. As anthropologist Shara Bailey at New York University says, they were like "external" teeth. "Your teeth are really for processing food, of course, but if you do all the food processing out here," she says, gesturing with her hands, "if you are grinding things, then there is less pressure for your teeth to pick up the slack." 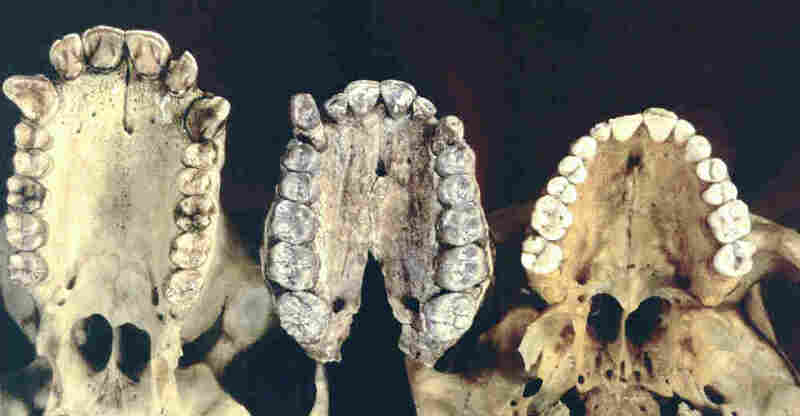 Our teeth, jaws and mouth changed as well as our gut. Meat is packed with lots of calories and fat. But adding raw meat to our diet doesn't tell the whole food story, according to anthropologist Richard Wrangham. Wrangham invited me to his apartment at Harvard University to explain what he believes is the real secret to being human. All I had to do was bring the groceries, which meant a steak — which I thought could fill in for wildebeest or antelope — and a turnip, a mango, some peanuts and potatoes. As we slice up the turnip and put the potatoes in a pot, Wrangham explains that even after we started eating meat, raw food just didn't pack the energy to build the big-brained, small-toothed modern human. He cites research that showed that people on a raw food diet, including meat and oil, lost a lot of weight. Many said they felt better, but also experienced chronic energy deficiency. And half the women in the experiment stopped menstruating. Wrangham urges me to try some raw turnip. Not too bad, but hardly enough to get the juices flowing. "They've got a tremendous amount of caloric energy in them," he says. "The problem is that it's in the form of starch, which unless you cook it, does not give you very much." Then there's all the chewing that raw food requires. 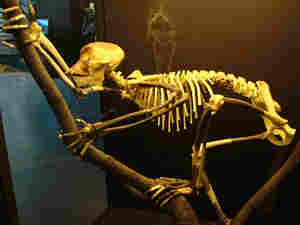 Chimps, for example, sometimes chew for six hours a day. That actually consumes a lot of energy. "Plato said if we were regular animals, you know, we wouldn't have time to write poetry," Wrangham jokes. "You know, he was right." 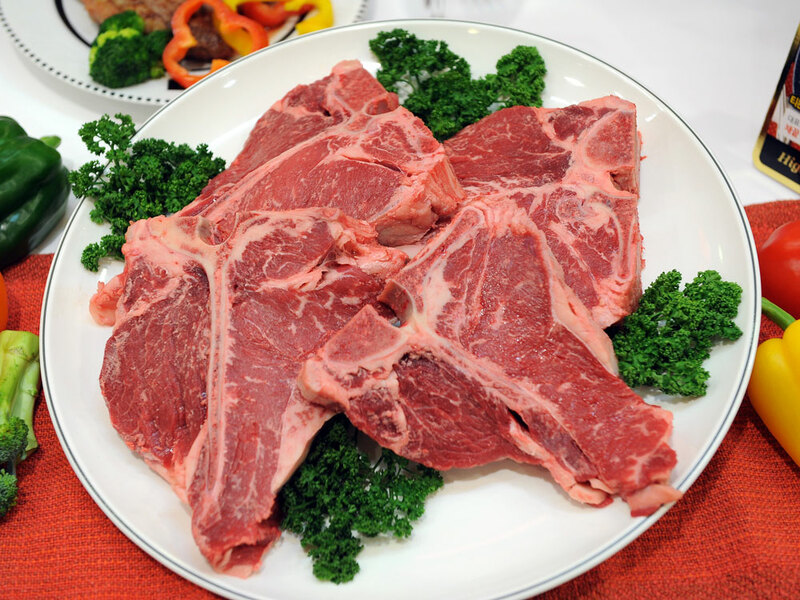 One solution might have been to pound food, especially meat — like the steak I brought. "If our ancestors had used stones to mash the meat like this," Wrangham says as he demonstrates with a wooden mallet, "then it would have reduced the difficulty they would have had in digesting it." But pounding isn't as good as cooking that steak, says Wrangham. And cooking is what he thinks really changed our modern body. Someone discovered fire — no one knows exactly when — and then someone got around to putting steak and veggies on the barbeque. And people said, "Hey, let's do that again." Besides better taste, cooked food had other benefits — cooking killed some pathogens on food. But cooking also altered the meat itself. It breaks up the long protein chains, and that makes them easier for stomach enzymes to digest. "The second thing is very clear," Wrangham adds, "and that is the muscle, which is made of protein, is wrapped up like a sausage in a skin, and the skin is collagen, connective tissue. And that collagen is very hard to digest. But if you heat it, it turns to jelly." As for starchy foods like turnips, cooking gelatinizes the tough starch granules and makes them easier to digest too. Even just softening food — which cooking does — makes it more digestible. In the end, you get more energy out of the food. Yes, cooking can damage some good things in raw food, like vitamins. But Wrangham argues that what's gained by cooking far outweighs the losses. As I cut into my steak (Wrangham is a vegetarian; he settles for the mango and potatoes), Wrangham explains that cooking also led to some of the finer elements of human behavior: it encourages people to share labor; it brings families and communities together at the end of the day and encourages conversation and story-telling — all very human activities. "Ultimately, of course, what makes us intellectually human is our brain," he says. "And I think that comes from having the highest quality of food in the animal kingdom, and that's because we cook." So, as the Neanderthals liked to say around the campfire: bon appetit.